In this sequel to Year of the Dog, Pacy Lin is facing another new year. 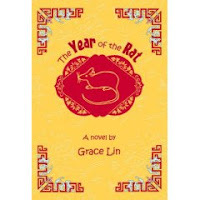 The year of the rat is a year for changes and Pacy is not at all sure that she wants anything to change. When Pacy's best friend Melody moves to California, Pacy feels lost. Her other friends at school don't understand her the way Melody did. Worse still, a new family from China is renting Melody's house and Pacy's parents expect her to befriend the social outcast Dun Wei. Pacy's questioning her friendships and her talents (after she learns that being an artist is considered a "cold door"... a career that won't bring much wealth), but if she can make it through the year of the rat, she might find that she herself has changed for the better. This book is told in the same style as TYOTD with Pacy's relatives interjecting anecdotes about their own lives or Chinese legends. I read this book for the Expanding Horizons challenge. I love the character of Pacy and I think she's really accessible to kids. It's great to find another transitional chapter book that I can recommend to fans of Clementine and Ruby Lu. On February 7, 2008 the Year of the Earth Rat begins as the year of the Fire Pig comes to an end. The Pig is the last sign in the Chinese Zodiac and the Rat is the first sign. Therefore we are now at the end of one 12 year Chinese Zodiac cycle and the beginning of another one. If you are looking for closure, now is the time in the last few days of the year of the Fire Pig. If you are looking for a new beginning, a fresh start approaches with the year of the Earth Rat. After two Fire years in a row, life may seem calmer during this Earth year. That could be deceptive, however, as the Rat never stops moving, especially when it comes to mental activity. According to the popular legend, the Rat was the first to arrive to a dinner hosted by Buddha (but only after hitching a ride on Ox’s back and then jumping over the finish line) so this is why the Rat is the first sign of the Chinese zodiac. It signifies new beginnings. 2008 is therefore an appropriate time to commence new ventures, including new ideas, directions, and ways of doing things. There will be ample time to see your projects through and opportunities for you to achieve success. However, keep in mind that your actions may have long terms effects, so be wise with your decisions.